U N L E A S H E D Skillet lets their music speak the loudest. That’s how the quartet has cemented its place as one of the 21st century’s most successful rock bands. 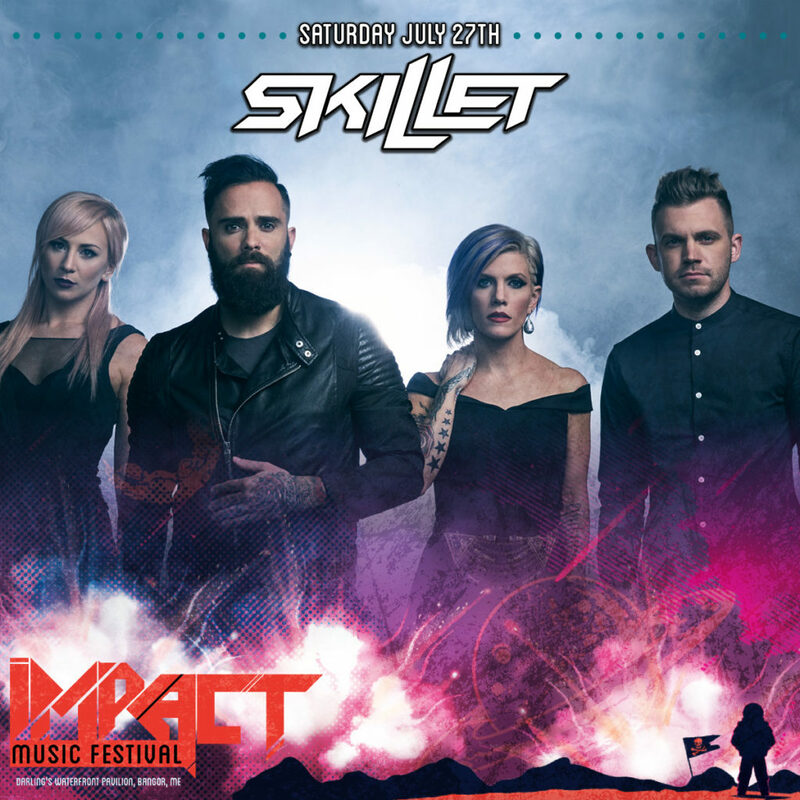 Selling over 11 million units worldwide, the Wisconsin quartet—John Cooper [lead vocals/bass], Korey Cooper [guitar/keys], Jen Ledger [drums/vocals], and Seth Morrison [lead guitars]—have received two GRAMMY® Award nominations and won a Billboard Music Award for the platinum-certified Awake. Their double-platinum single “Monster” is “the eighth most-streamed rock song of 2015” with a total of 57 million plays (and counting) on Spotify and would earn the distinction of becoming “the best-selling digital single in the history of Christian Music.” 2013’s Rise bowed at #4 on the Billboard Top 200 upon release and received resounding and eclectic acclaim from the likes of USA Today, New York Times, Revolver Loudwire, and more. The group’s ninth full-length album, UNLEASHED [Atlantic Records/Word], sees them turn everything up louder, amplifying all aspects of their signature hypnotic sound. Channeling an intense muse, John immediately commenced writing just months after Rise hit shelves. “By the time Rise came out, I could take a little bit of a breather and experience it,” he explains. “I remember thinking, ‘this feels important to me, but I need something a little more urgent.’ I didn’t want whatever we did next to be so emotionally heavy. I wanted to make a record that made people feel the music – an album that would connect people to the music as well as to each other. An album, like some of my favorites, that’d be like a party to listen to – where people could sing along – together. That idea solidified as Skillet toured Europe in 2013 with Nickelback. Night after night, John watched the non-English speaking audience sing every word back to him. It left an indelible mark on his writing process. “It struck me, how music is much bigger than a language,” he affirms. “There’s a universal feeling. We wanted to get that emotion across more through the music than with the words. I aimed to write songs people could easily relate to anywhere and everywhere.” Getting off the road in 2015, John headed to Los Angeles to begin recording what would become UNLEASHED with producer Brian Howes—who helmed the 2006 platinum-selling Comatose and co-wrote the platinum No. 1 smash “Awake and Alive.” Cutting half of the album with Brian, John tapped the talents of multiple producers for the first time in Skillet history, working with both GRAMMY Award winning producer Seth Mosley in Nashville and Kevin Churko [Five Finger Death Punch, Ozzy Osbourne, Disturbed] in Las Vegas. “Comatose was a very special album for a lot of reasons,” he continues. “We wanted to record with Brian again and when the chance came up we were both ready to go. I’m also a huge fan of Kevin Churko, and it was amazing to have the opportunity to write with him. When I met Seth we just clicked. The entire process with each of them was such a great experience.” The first single “Feel Invincible” explodes to life on a swinging guitar chug transitioning to sweeping electronics and a theatrical vocal call-and-response. Everything culminates on a towering chant that’s impossible to shake just as a melodic guitar lead takes off. “It’s a fight song,” says John. “Sometimes, everything in the world makes you want to give up. This is a reminder not to. I think, ‘This is my life. This is my family. I can’t go around being scared all the time.’ I have the strength to face what’s happening.” On the other end of the spectrum, “Stars” shines with a passionate and poetic refrain, “Here I am, lifting up my heart to the one who holds the stars.” Amidst the shimmering electronics and orchestration, it carries a message that John hopes will be easy to understand. “It goes along with wanting to speak to as many people as possible,” he continues. “On a deeper spiritual level, for those who may not believe, it’s saying that there’s something bigger out there—whether it’s your community, family, or friends. Basically that we’re not, and don’t have to be alone.” Whether it’s the snapping crunch of “Burn it Down” or the skittering crash and burn on “Out of Hell,” the record exudes a propulsive energy that can speak to both sides of the band’s audience, whether they’re sharing a bill with Disturbed or Lecrae. “It’s been an amazing journey,” John leaves off. “The fans, the Panheads, means everything to us. They’re the reason we’re here. They make our shows what they are. We wanted to give that energy back to them in UNLEASHED.” Ultimately, this is Skillet at their most potent, pure, and powerful.